The exec formerly in charge of Apple’s (s AAPL) famously successful in-store experience, is paving a new path for electric vehicle company Tesla (s TSLA) Motors. 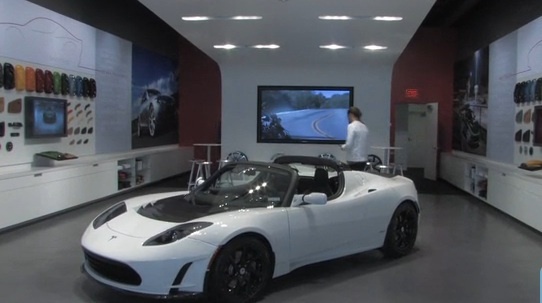 For this week’s episode of our Green Overdrive show, Tesla’s VP of Worldwide Sales and Experience, George Blankenship, shows us around Tesla’s first experiential store on Santana Row in San Jose, Calif. The idea is to create a new hands-on experience around buying one of Tesla’s EVs, and the store officially launches this weekend. Does it convince you to buy one? I’ll be interviewing Tesla’s Model S Program Manager, Jerome Guillen, and Coda Automotive’s VP, Corporate Strategy and Business Development, Chris Paulson, at Green:Net next week on April 21 in San Francisco! Other connected car speakers include execs from Ford, GM’s Onstar, and startups like Virtual Vehicle Company. Get tickets here while they last! I don’t think Apple stores would be a hit if they didn’t stock anything you could buy for under $50,000. The usual car dealership “user experience” does leave a lot to be desired, though. Tesla scored big when they hired George Blankenship to head their sales team. The store looks amazing and building on Apple’s retail success is a smart move. Watching the video of the store increased my desire to have one of these.